Tatum Ranch was one of the first master planned communities north of hwy 101 in what I call the Tatum Corridor. The Tatum Corridor is made up of Desert Ridge, Tatum Highlands, Diamond Creek & Tatum Ranch. As one proceeds north from Desert Ridge, properties tend to become more affordable. There are still new home subdivisions in the area, which are the exception to this rule. Tatum Ranch was mostly built between 1992 to 1998. Located approximately 6 miles north of the 101 and 10 minutes south of the Town of Cave Creek. Even though it has a Cave Creek mailing address, it's located in the city of Phoenix, which makes Water / Sewer / Trash, Fire & Police services very affordable. Children who live in Tatum Ranch go to the Cave Creek Schools, with some charter school options. 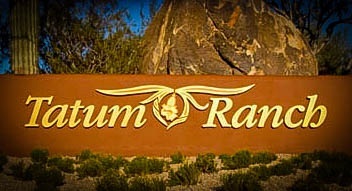 In the center of Tatum Ranch, is a Tatum Ranch Golf Club which offers junior golf, fitness, golf and social packages. For membership information go to http://tatumranchgc.com. Over all this is a relatively inexpensive community when compared to the communities in North Scottsdale. I highly recommend this area having lived in Tatum Highlands since 1998. I guess you might say this is my favorite part of town!